New Mexico fight fans will be treated to some high level Flyweight action on Friday night. On January 6th inside the Route 66 Casino, Fresquez Productions is hosting an event called “Havoc” and will feature top women prospect Holly Holm fighting in her sixth MMA bout. Before that main event, another prospect from New Mexico will be featured inside the cage as Jackson-Winkeljohn product Nick Urso (6-1) will take on a very game Jesus Urbina (2-1). The Southwest area is home to dozens and dozens of very talented up-and-coming fighters and it seems like every few months another prospect pops up from within the state’s ranks to announce themselves as a fighter to keep an eye out for. One of those fighters who has been on the radar for a while has been Urso and he is currently riding high on a five-fight win streak leading to the Albuquerque trained fighter becoming one of New Mexico’s premier talents. Jesus Urbina (pictured) returns to New Mexico seeking the biggest win of his career against highly heralded prospect Nick Urso. For 24-months straight, Urso has been flawless in his delivery within the confines of the cage and he has won bouts in every type of method. Urso has racked up two unanimous decisions, two submission finishes and in his most recent outing Urso notched his first career knockout victory. Urso’s combination of speed, technique and natural talent has placed his name front-and-center in the discussion of who is New Mexico’s best fighter not-signed by a major MMA promotion. Looking to stop the momentum of Urso, Bushido MMA’s Jesus Urbina is coming from El Paso, Texas looking to notch his third straight victory. New Mexico fight fans may recognize Urbina as an opponent of another New Mexico opponent. Urbina had a tough draw for his first professional bout when he took on Judgement MMA’s Adrian Cruz in a bout over a year ago for the King of the Cage promotion. While he didn’t pick up the win, he fought valiantly against a bigger opponent and made it to see the judge’s scorecards. Urbina is very tough in all areas of MMA as he can trade punches in and outside of the pocket, he is very good at scrambling in his defensive grappling and he can finish fights when he gets top position on the mat. All of those compliments only accent his respected wrestling game; Urbina in fact has a collegiate wrestling background. 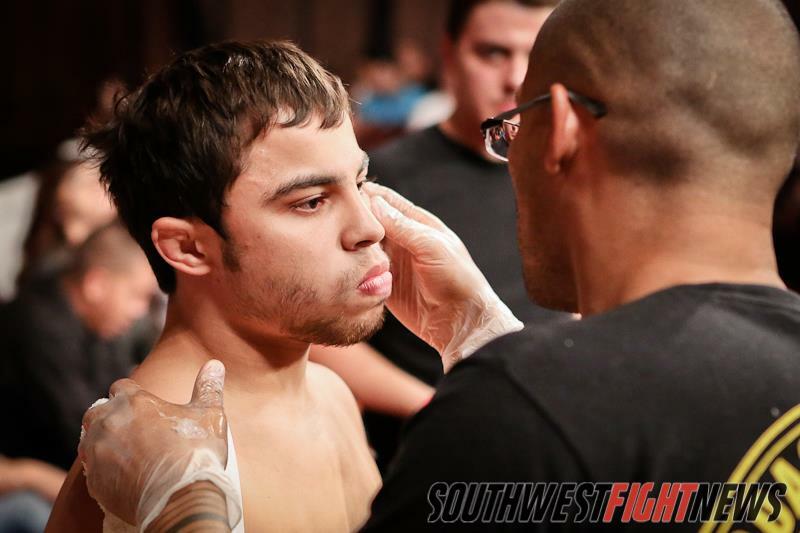 The well-rounded talent of Urbina is solidified by his training at the reputable Bushido MMA gym where Head Coach Shane Schuman has a stable of fighters who the area should take note of. Urbina has notched two wins in El Paso’s Rocktagon MMA promotion and will provide arguably one of the stiffest tests for the highly acclaimed Nick Urso. Urso’s talents speak volumes inside the cage as the native Floridian can do just about anything he wants once the cage door shuts. Urso has a very good ground game and has a crisp, lethal striking arsenal. Not only is Urso a punisher offensively, his talent from his active guard makes it very difficult for opponents to put Urso on the defensive. Arguably his best quality however, Urso can push the pace for three-rounds remaining patient, calculated and effective for fifteen minutes if needed. In his last bout, Urso engaged in a stand-up affair that saw a well-timed knee from inside range end the fight emphatically. That sort of fight ending technique makes Urso dangerous on the feet and when taking into equation his dominant top game when grappling, it seems as if Urso’s offense can be unstoppable. The Bushido MMA vs. Jackson-Winkeljohn rivalry continues in this Flyweight affair and intrigue builds when we remember Urbina is well-trained and part of an amazing camp. The Bushido MMA roster has found success in events against their Jackson-Winklejohn roster and their competitive rivalry has really pushed the smaller El Paso gym to step their preparations up to match the preparations of the Albuquerque trained fighters. Urso has the fortune of being part of training camps with some of the very best fighters in the entire world as well as some of MMA’s premier coaches. With sparring partners like UFC contenders John Dodson and Diego Brandao and knowledge and training from coaching guru’s like Brandon Gibson; it is no surprise that Nick Urso is rising up the ranks as quickly as he is. This fight should be fast-paced and exciting as most Flyweight bouts tend to be and with two very talented, well-rounded fighters meeting one another in the middle of the cage, it is hard to imagine why anyone would want to miss this one. Stay tuned to SWFight for more event coverage, bout breakdowns and analysis. We hope to see everyone this Friday night inside the Route 66 Casino for the “Havoc” MMA event. For ticket information call (505) 884-7484.